Last month I decided to add some US exposure to my portfolio and was searching for a suitable investment. The iUnits ETF seeks to match the S&P 500 and is hedged to Canadian dollars which I'm not overly concerned with. It also primarily invests in the iShares fund. Because of this, its management fees are higher and performance lags both VTV and IVE. 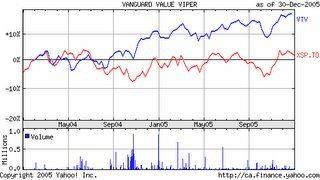 IVE vs VTV has a slightly higher MER at 0.18% vs 0.11% and while the two securities are pretty close in terms of returns over the past 2 years, I decided to go with VTV. 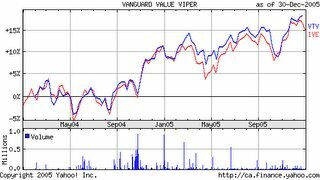 I'm not expecting much difference in performance between the 2 securities over the long term, but the slightly lower MER and the lower current market price $57.17(VTV) vs. $65.05 make it more attractive for myself. 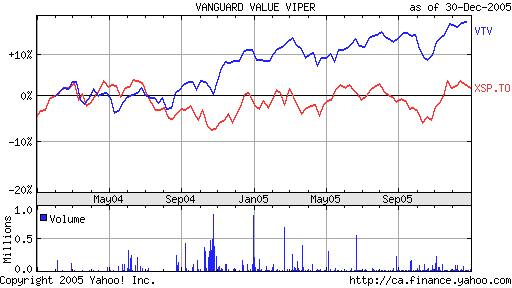 FC: XSP used to be unhedged and used derivatives to match the unhedged performance of the S&P500. Well, past three years, the C$ has appreciated close to 30%. 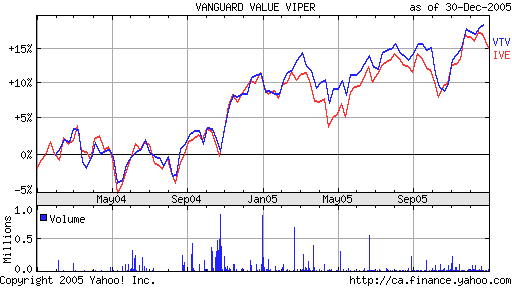 That is why the XSP (in C$) is badly trailing the IVV (in US$). In C$ terms, you will have very similar returns. The new XSP (tracking the IVV with a US$ exposure hedged) should be superior if the C$ appreciates a lot from here. IVV will be superior if the C$ depreciates from here. The MER difference is too small to notice in the short run. Also, don't forget that you are paying commissions to convert your C$ to US$ if you invest in the IVV.